First off, I have to say that there is no sure fire formula for making a masterpiece. There is no one method, magic medium, palette, ground, or brushes that will replace good old fashioned study, practice, patience, and passion. That being said, no one has to be lost and wandering in the wilderness, so to speak, there are trails laid down before us: systems and tools that can help you along your path. Painting is difficult enough without tripping yourself up all the time. So, if you have a goal in mind, you can find a great deal of value in the methods of the masters and use them as is, or adapt them to your own specific needs. In this vein I would like to share with you Odd's materials, including one palette that he often uses for developing flesh. 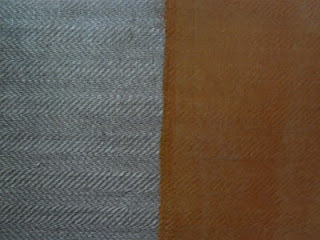 Odd uses a very heavy herringbone weave linen. This is not the secret to his texture, but it is incredibly durable and invaluable for his technique. You can see the color and value in this image. It's a very strong and flexible ground. In fact, you will tear the canvas before you would be able to remove it. This is very important, as this ground is like nothing I've ever painted on before. Mix the Blanc de Meudon with boiled linseed oil very thoroughly, about 30% boiled linseed oil. This is very important: Mix it with a large palette knife until it's a very thick consistency and you feel strong resistance when mixing - almost to the point where it begins to crumble, but is still a viscous fluid. Also important: You must add enough opaque oil paint so that the ground is not transparent! Odd uses burnt sienna, yellow ochre, titanium white, and a little mars black to neutralize the color. But he also sometimes mixes mars black and yellow ochre to produce a nice green ground. He adds titanium white for opacity, which you'll find absolutely necessary. Or you can use only titanium white if you want a light ground for more luminosity. This works well if your technique relies on a lot of glazing. A light ground will not work if you are scraping and sanding. You apply it straight to the canvas that has already been sized with rabbit skin glue (or PVA sizing for an alternative) with a large palette knife. Scrape it smooth so that the ground rests in the furrows of the weave and a thin layer on the ridges. Try not to leave any ridges from the palette knife. Let that dry for two or three days and repeat. 2 layers should be fine. You should be able to paint on it after a week. Essentially, gesso is a cheaper replacement for this. Gesso is chalk suspended in oil, but the stuff that you buy in the stores is not ground as finely, nor is it as absorbent as blanc de Meudon. Blanc de meudon is composed of particles of calcium carbonate, also known as Precipitated chalk, or Spanish Whiting). It is the main component of limestone and chalk. It is composed of a very fine chalk and boiled linseed oil. He, of course, uses the finest of both. But I have found that quality chalk is more important than the oil, so since I'm on a budget, I go for the good chalk and use merely decent boiled linseed oil as opposed to the stuff that he uses, which he has specially made for him. Odd uses anything and everything can find. So, there's little I can tell you here. He tends to like cheap brushes, but keeps a few nicer ones around. Take note of the pre-mixed colors. He has chosen these specific values and tubed the mixtures in order to make modeling flesh faster and easier. This is one thing (as well as great skill and years of experience) that enables him to mix color right on the canvas as he goes without mixing on his palette. The palette alone is also not the trick to great flesh tones. It has to do with nuances created in the process of painting between the palette, application of broken color, textural variations, and subtle layers of semi-opaques, glazes, velaturas, semi-transparents, etc... which makes the flesh look luminous, semi-transparent, and thus: lifelike and beautiful. Here's an old posting I did on technique that will be quite helpful. Oil Painting Techniques: Glazing. The part about light temperature and form at the end is particularly relevant to this discussion. Odd, like all masters old and new, understands two different modes of temperature in painting flesh: local temperature and form temperature. Form temperature, I've detailed in the above link. As far as local temperature is concerned, a great example are the ear lobes, nostrils, hands, toes, and cheeks. The color of the flesh in these places tends to be warmer as blood vessels approach the surface of the skin. Conversely, in areas such as the forehead, where there is very little between the skin and bone, the color tends to be cooler in temperature. Take note of these while painting and you will notice a tremendous difference. As if that wasn't enough to keep track of, Odd also uses another means of color shift on a large scale for both compositional, and illuminatory purposes. This is loosely based on optics, but is greatly exaggerated to exquisite effect. It's quite an interesting and beautiful concept: as light gets farther from the source it scales through the spectrum from yellow, closest to the light source, to orange, red, violet, and all the way to blue or sometimes green. You can see this particularly in his void paintings. Now this is a general rule of thumb. If you look closely, he breaks and bends it all the time. Also, he takes into account local shifts in color and temperature as well as form shifts in color and temperature. Furthermore, there are changes in chroma related to the light, the angle of the planes of the form, local temperature and chromatic shifts in the skin, and some changes made purely for compositional purposes. As he moves into the shadow the color becomes cooler and more neutral. It's actually quite simple. Like Rembrandt did, Odd uses primarily refined linseed oil which he lets stand in a jar... so it becomes essentially stand oil. That, mixed in various percentages with turpentine (he tends not to be particular about it), becomes a versatile medium. Here's a great resource for mediums: Table of Mediums . As an addendum, even in Odd's earlier pieces you can see the same form and local temperature shifts. I simply used the Void paintings as an example because the exaggerated use is more obvious and more easily studied. thank you so much for this post. i really look forward to the things you put on this blog. this is so informative and helpful. Thank you for this post. Did he also use Old Holland Yellow brown, Caput Mortem Violet, or Schvenigans orange at all? Did he use any lake colors for glazing? Did he mix greys from green umber, brown ochre + white? Thank you. Thank you for this info! Seeing his palette laid out in values helped a great deal! You said this was one palette. Do you know of any other ones he uses? Does he use old yellow brown, or make greys from green umber + brown ochre + white? Care to shed some light on any other info such as his optical blues and greys methods? Tom, thank you very much for sharing that with us! I have seen him use yellow brown in different pallettes. I've never seen him use Kaput Mortem, though I love that pigment. I have heard that he used Schvenigans Orange, though I've never seen him do it. My guess is that would be reserved for his daylight paintings "Lack of Darkness". He told me that in the past he has used green umber, but now he is limiting his pallette more. But he does have a number of tubes of premixed greys, so it's likely that these are from various pigments and white. Though, I haven't seen him use most of them. As I said, these are probably components of other pallettes. And keep in mind that each pallette is carefully constructed with a mind to how each pigment and color will interact through his painting process. He does sometimes introduce a carefully used stray color, but this is based on his many years of experience and knowledge of how it will interact with the pallette. As far as optical blues, I'm assuming your how a grey can look blue. This is specifally relative to the color adjoining it. A grey may look blue when placed next to an orange. The intensity of the blue percieved is proportionate to the intensity of the orange. Check out Joseph Albers for more info on color theory. Here's an e-mail I would like to share because I think our discussion would be helpful for others to read. I hope I don't put you to any trouble here. I read with interest your account of how Odd Nerdrum prepares a ground for oil painting by using the Blanc de Meudon with refined linseed oil and mixing that with pigment, on your Art Bagel Blog. I take it that the colours mentioned are dry pigments and not oil paint from the tube? Its just that some artists add a background colour plus a fast dryimg medium, but after priming with a white ground. What proportions of each should one add? In Ralph Mayer's book "The Artist's Handbook" he states that a glue gesso is made with half chalk and half zinc oxide with 25 to 50 cent linseed oil added. Is this the same primer you have in mind?I have tried to find Blanc de Meudon on the net but came up with nothing. I don't think it is available in Australia. The substance you mention is it French chalk? If it is I can get that from a firm in London. Thank you so much for your time and hope I don't take up too much of it! I would be most grateful for your assistance. I wonder whether you have tried Michael Harding oils? I find them to be most excellent!" It's good to hear from you. I really liked your piece in the KB 08. Tom Cleveland, A friend of mine in the states has done some searching and found another name for the Blanc de Meudon and also a supplier. If you look at the comments on that article he has kindly shared it with everyone. I would have recommended dry pigments, but when I asked Odd he said that if you use old holland, because it has a high pigment density, it should be fine to use it straight out of the tube. He sometimes uses an alkyd drier, which is only two drops for a batch the size of a small pizza, I think the same proportion would be fine with cobalt drier. Odd applies this ground directly to the canvas (already sized with rabbit skin glue or PVA sizing = this is just a transparent glue that seals the weave of he linen) because an intermediary layer of gesso would interfere with the strength of the bond with the linen. You can add titanium white to the blanc de meudon instead of another color and this mixture can act as an off white priming upon which you can put your imprematura if you want more luminosity for glazing and such. I've seen that recipe in Mayer's book, but I've never tried it. I think it is essentially the same as Odd's. Odd decides the percentage of oil by feel as he's mixing, but I think it does come to approximately 30%. No, I haven't tried Michael Harding oils. I'll have to check them out. I fell in love with a few brands that are hand made in NY: Vasari and Robert Doak, but I can't get them everywhere, so I've been using Old Holland mostly. Hello, I am a student at the academy of fine art in Pennslyvania. 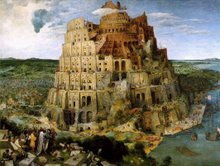 I wanted to add some additional things I have learned about Odd Nerdrum through attending the school. 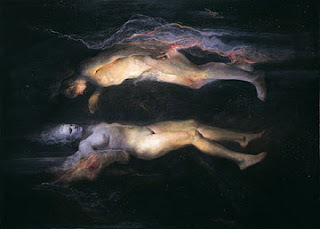 Odd Nerdrum teaches at my school sometimes and so I have picked up some tips from those who are friends with him. At one of his demos he also used a smoke screen to check simplify his lights and darks. He also had a few colored gells. He used the gells to see what certain areas might look like with a little more yellow or blue, etc. He also used sandpaper alot to keep his darks transparent on the flesh tone and to reveal the red oxide ground. Thanks for the addition Ian. Yes, to be more specific, the "smoke screen" you refer to is a dark lense that he looks through to compress the value range and get a better idea of the value relationships in the composition. I don't know exactly what it's called, but you can get it at any well stocked photography store. hey richard thanks for this post. i also have questions about the ground prep. i was recently in paris and got some (Blanc De Meudon) for myself to try out but couldnt figure out if i was doing it right. i already have a few canvases going but dont know how long i should wait before painting on them. thanks. Since I've received several questions on the ground. I will revise the artitcle to include more information. Thank you very much for very valuable informations. 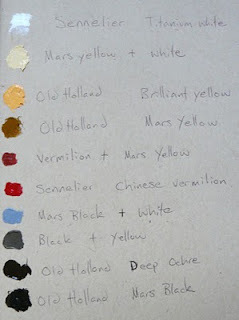 I would like to know where can i find OLD Holland Yellow, Caput Mortem violet?? I dont think i could have find in France or do you know any equivalence ? i can explain how we use ( in PAris ) le Blanc de Meudon. We first use 180 gr of rabbit skin glue ( put it one to two hours in the water . When its getting soft ., put it in 1 lt of water to heat on "bain MArie" . When the glue gets enought warm add blan de maudon with your hand not with spoon. Because you can crash more the Blanc de meudon , add slowly let it comes down into the glue . When there is enought Baln de meudon you add more water . My friend , thank you so much for all this nice website !! For those who live in the US check out Natural Pigments they sell a pretty good selection of gesso and chalks. They have several extra fine calcite mixes. As well as grounds such as Bologna Chalk and Italian gesso. I discovered you can't use this ground on panels. Hi Richard, I haven't seen this blog before... nice!, I've enjoyed reading it and like all of your insights into the world of Odd... seems like everyone is happy for the shop talk and info too, I don't know if you have mentioned it elsewhere but besides a bit of alkyd he used a little titanium white along with the color to make the mix more opaque avoiding stuff from seeping up later and discoloring his work, also a splash of turpentine which he said was important... maybe to aid in the mixing of the ingredients or to lean the mix a bit... I don't remember do you?, did he show you that?. also please tell me why the finer chalk is better... he never said anything to me about that and I want to make sure I'm using the right stuff! Yes, that's absolutely right. I thought I had included that, but apparently not. Thanks for pointing it out as it's quite important. I've edited to include the titanium white in the ground. I don't remember the turpentine. I've been making it without turp for quite some time now and haven't had any problems... but maybe it has something to do with being able to absorb more chalk into the mixture since the turp will evaporate? The fine chalk is important in order to create a stronger bond with the oil. Larger pieces will produce a less strong and elastic surface, plus won't be as smooth. The smoother the surface, the more the brush strokes stand out in relief and the more you can control the surface texture in general. ok you described the canvas, the ground, the palette, the mediums - and then you stopped......?! what about his painting process technique - what about Odd in the real action of painting ? Can you tell us anything about that? what about his actual PAINTING technique? what about sanding, scraping ? What for you want to know about sanding , scrapaing or the process of painting of Nerdrum? Is not enough all this knowledge? I recomend you to learn many other things FIRST and then you will can add Nedrum way of painting to your owns works. When you said to use boiled linseed oil in the ground, do you mean the kind that is used for treating wood? I would recommend the kind of boiled linseed oil that you can purchase from Sennelier as it's refined before being cooked. If you use an a linseed oil that isn't refined, it will yellow more heavily and quickly over time. 1)Does he also use his ground mix(oil+chalk)as a painting medium? 2)How fast does this oil dry? (I have prepared real sun-thickened oil which dried in less than a day but has to be made as it was done before the pre-industrial era). hello, Would it be O.K to use traditional black oil for the ground, as it contains litharge to quicken the drying time? It would be fine to use black oil as it's quite stable, though particularly expensive. Is Blanc de meudon solely ground calcium carbonate? Or is there something else mixed with it? I can obtain calcium carbonate under the names "chalk from champagne" from kremer pigments and "marble dust" from langridge artists colours. Would these products work for this strong self made gesso? 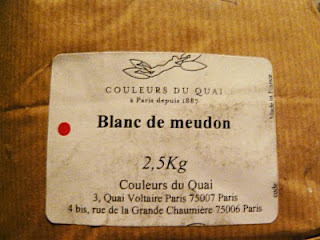 Or do I need to source this Blanc de meudon (which is proving most difficult)? Yes, it's simply calcium carbonate, so if it's finely ground enough, your chalk from Champagne or Marble dust is the same thing. Just curious, would that chalk ground recipe you mention above be for every ground you want to paint on or are you just relating Odd's own particular recipe he uses. I'm planning on doing my first chalk gesso ground to paint on but am unsure if what you mention above is good for any style of oil painting. I'm planning on doing some Caravaggio copies. I hear he would mix pigments with each layer of the gesso ground, so that they interact with one another? Anyhow, thanks for the blog, its great. Can Art be Taught to the Facebook Generation?